• What Is Going on With Steve King? It is not easy these days for Donald Trump to make headlines with his Twitter behavior. After all, he's shocked and outraged people so often that nearly anything he might do is old hat. Nonetheless, on Sunday he managed to easily clear the high bar he's set for himself, sending out nearly 30 tweets, some of them pretty far out there. To start, Trump slammed Saturday Night Live (once again), and over the course of two tweets threatened to have the show investigated for its failure to live up to the fairness doctrine. What Trump apparently doesn't know is that: (1) The fairness doctrine was killed by the FCC in 1987, and (2) If it was still on the books, Rush Limbaugh, Fox News, etc. would not be possible. In addition, it appears to have escaped Trump's attention that this week's SNL...was a rerun. Trump also laid into the Steele dossier, Hillary Clinton, and the "witch hunt" over eight different tweets, claiming that the Democrats are trying to "steal" an election (whether he means 2016 or 2020 is unclear). It was during this run that he blasted John McCain, who is unable to respond by virtue of being deceased. Meghan McCain is able to respond, and did, which Trump responded to by retweeting a tweet about how much people hate the McCain family. Minutes after suggesting that SNL should be taken off the air for being unbalanced and portraying only one viewpoint, Trump called—without irony—for Fox to reinstate Jeanine Pirro, who is not exactly known for her evenhandedness or her fairness. Although Fox News is not confirming it, it appears that they have suspended (or possibly even canceled) Pirro for some particularly Islamophobic remarks that raised the hackles of advertisers. Her show has not been aired for the past two weekends, and her Twitter account has been silent since March 10. Over the course of the day, Pirro was favored with about 10 presidential tweets. The President also voiced his support for Tucker Carlson, who is known for saying...well, racist things. At the same time, Trump suggested that the time has come for Fox to fire Arthel Neville, Leland Vittert, and Shepard Smith. Those three, along with Chris Wallace, are among the few on-air personalities at Fox who can legitimately be regarded as journalists. There were three tweets on border security, including a retweet of a vaguely racist tweet from conspiracy theorist Jack Prosobiec, best known for his promotion of unhinged theories about the death of Seth Rich. Trump also retweeted a "news story" that implies Rep. Ilhan Omar (DFL-MN) is about to be recalled by voters in her home state. In truth, members of Congress are not subject to recall elections. There were several tweets about how popular Trump is both nationally, and in the state of Pennsylvania in particular. There were two St. Patrick's Day tweets. Erin go bragh! There were several tweets about how great things are going for the U.S. economy, and in among them an incongruous tweet blasting General Motors for shipping jobs abroad. Part of what made the performance so noticeable, and perhaps so shameful, is that it happened against the backdrop of the New Zealand shootings. It is true that Trump did offer a very cursory statement of support for New Zealand shortly after the news first broke. However, he might have followed that with a tweet or two denouncing white supremacy, or Islamophobia, or hatred in general. Failing that, he might have remained silent out of respect for the 50 victims, whose deaths came at the hands of a man who viewed Trump as an inspiration. But instead of saying something helpful, or at least saying nothing at all, the President decided to spend the day (and, in fact, the weekend, since there were also 19 tweets on Saturday) airing grievances and settling scores. In short, everyone noticed that this was an unusual weekend, even by Trump's standards, and quite a few pundits think it says worrisome things about the President's mental state. Speaking of the various strains upon Donald Trump, here's a big one reported by The New York Times on Monday. According to their sources, Deutsche Bank has loaned Donald Trump more than $2 billion over the last 20 years. In order to secure those loans, Trump often misrepresented his net worth, and used somewhat questionable tactics with bank employees, like giving them free trips to Mar-a-Lago in exchange for their support. Deutsche Bank is the most notoriously shady international bank in the world, and has been linked with extensive money laundering operations. Generally speaking, wholly legitimate businesspeople and businesses avoid it, because of its less-than-stellar reputation. Trump most certainly has not paid off all of that $2 billion, and very possibly still owes most of it. This puts the bank in an awkward situation, but also raises the possibility that he could be compromised in one way or another. If that headline had been exactly the same, except with 'Obama' in place of 'Trump,' it would have almost certainly referred to some sort of effort to make student loans more manageable for students and parents. But with the current administration, it means something nearly the opposite. This weekend, news broke that Secretary of Education Betsy DeVos, wants to slash the budget for the Obama-era program that forgives student loans for those who go into public service. Because if anyone is sensitive to how hard it is to pay for a college education, it's Betsy DeVos, who was born with roughly five silver spoons in her mouth. Meanwhile, the administration also wants to impose a cap on the total amount of money that students can borrow: $57,500 lifetime. From a public policy perspective, there is some justification for capping loans, since easier loans make it easier for schools to raise tuition. However, these two policy initiatives, taken together, would serve to significantly limit upward mobility for millions of students. For private schools, where an undergraduate education can easily run $200,000, $57,500 is something of a drop in the bucket. And that is before we consider graduate or professional school, which can double the tally. Even if one spends their whole career at public schools, $57,500 is not enough to cover four years of undergraduate education, much less the five or six years that has become the norm (nor, once again, graduate school). The administration observes that the cap is only on students, and that parents would still be free to borrow until the cows come home. However, many parents cannot qualify for loans, for one reason or another. Further, it is quite common to find parents unwilling to aid in their children's educational goals, perhaps because of estrangement, or perhaps because Mom and Dad want Junior to major in business, but Junior wants to major in philosophy. (Z) personally experienced this during his undergraduate years (Z Sr. didn't approve of fancy book larnin') and he hears it all the time from his students, including as recently as 90 minutes before writing this item. Anyhow, the upshot is that if Team Trump gets its way, private universities will become more elitist and un-diverse, public universities will be forced to do more and more with less and less, an undergraduate degree will become unattainable for a certain percentage of students, and a graduate or professional degree will become unattainable for an even larger percentage of students. Given that the U.S. already has a shortage of, for example, doctors, this would not seem to be a wise course of action. Of course, if we kick 20% of the population off the insurance rolls by killing Obamacare and not replacing it with anything, then maybe those doctors won't be needed after all. Yesterday, we had an item about some of the problems that Donald Trump will face when and if he stands for reelection in 2020. In short, some of the red states he won are trending purple, and some of the Midwestern states he won just elected a bunch of Democrats. Neither of these things is good news for him, since he would prefer not to have to defend the Texases and Georgias of the world, and he'll have to work even harder than in 2016 to win over the Wisconsins and the Michigans of the world. However, as The Guardian points out, Trump also has some things going for him in 2020. He's going to have vastly more money in his war chest. His team has also gotten serious about data, and his people have built a world-class analysis and polling operation for him. The campaign will also be able to deploy a vast army of volunteers, perhaps as large as 1 million strong. When Beto O'Rourke officially announced his presidential run, he got a whole bunch of publicity—far more than, say, Sen. Kirsten Gillibrand (D-NY), despite the fact that she basically announced twice. He also raised a whole bunch of money: $6.1 million in the first 24 hours. That's enough to impress even Sen. Bernie Sanders (I-VT). The purpose was twofold: to remind voters that O'Rourke isn't Latino, and that he once had a DUI arrest. As the barrage of attacks was coming in from the right, O'Rourke was also compelled to apologize for at least two mini-scandals of his own making. First, he made a few jokes last week about how his wife is raising their kids, and how he "helps sometimes." Some folks found that sexist, and so O'Rourke said he regretted his words and that he wouldn't make those jokes again. In addition, Reuters dug up something from the candidate's teenage days, namely his contributions to a hacking (and creative writing?) site many years ago. One of his stories, written under the pseudonym Psychedelic Warlord, was penned from the vantage point of a murderer. Anyhow, O'Rourke is sorry about that, too, and said, he was, "mortified to read it now, incredibly embarrassed...whatever my intention was as a teenager doesn't matter." And finally, there were also some attacks from the left, as well. The Atlantic, for example, published a piece about how O'Rourke's views on fiscal issues were rather more centrist in the past than they are today, and that voters may not forgive him for being a political chameleon. Slate, which, it should be noted, could very well change its name to "Bernie Sanders Fan Club," wrote two very critical pieces, one headlined "Beto 2020 Has No Reason to Exist," that points out that O'Rourke's platform is rather thin, and one headlined "It's Not All About the Money," that points out that O'Rourke is good at raising money, but that his platform is rather thin. So, they're covering all the angles. New York Magazine, which is clearly in search of a Pulitzer, ran a hard-hitting article about how O'Rourke likes to climb on tables and countertops when speaking at events, and that it looks silly. And The Hill which is itself a little right-leaning, nonetheless had a piece quoting many (mostly unnamed) Democratic strategists, who were unimpressed by O'Rourke's lack of substance, his perceived sense of entitlement, and his less-than-graceful campaign rollout. Speaking of Joe Biden, he's not even declared yet—well, except for a few seconds on Saturday before he corrected himself—and yet the target on his back is already getting bigger and bigger. On Monday, Politico observed that contrary to his blue-collar, working-class image, the former Veep is actually kinda loaded these days. His bank account was not terribly fat during his Senate or White House days, but since then he's been sitting on corporate boards and collecting hefty speaking fees, and he also wrote a bestselling book. Biden's exact net worth is known only to himself, his wife, and his accountant, but since he recently bought a $2.7-million vacation home, he's clearly doing ok.
What Is Going on With Steve King? Rep. Steve King (R-IA) is, to be blunt, the most openly racist member of Congress. And he's made that clear so many times that he nearly lost his recent re-election bid to an unknown Democrat, and then he managed to get himself stripped of his committee memberships, leaving him with not too much to do while he's in Washington besides wander the halls of Congress. Well, that and produce a number of outlandish and often offensive social media posts. 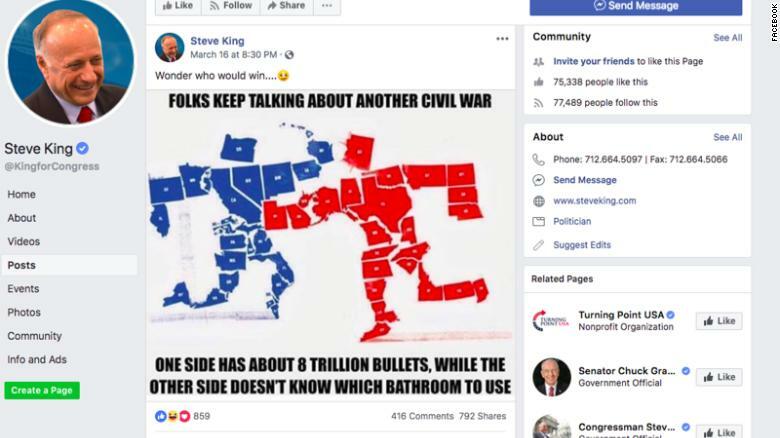 Clearly drawing inspiration from Donald Trump's veiled threat that there will be violence if he is removed from office, King's post celebrates the possibility of a second Civil War. It would seem that he did not look all that carefully, since Iowa is included among the mamby-pamby, pinko-Commie, don't-know-which-bathroom-to-use blue states. Or, since he regards himself as an honorary Confederate, maybe he did look carefully, after all. Although if he thinks there are no liberals with guns, he might want to pay a visit to Oregon or Vermont sometime.